The next morning they had me attached to the fetal monitors for awhile. I was borderline delirious because I hadn’t had any real sleep in almost 48 hours. I was also still in an enormous amount of pain. Lying on my side for the monitoring was excruciating. They were starting to talk about delivering again because the babies were not responsive. There was a constant stream of tears running down my face. They still had a strong heartbeat but they were lethargic….much like their mommy. My OB came in to visit me. She was immediately alarmed when she looked at me. I told her about the pain. She asked me if I minded if she checked me for dilation. She checked me and I was four centimeters dilated. It was finally time to have my babies. My tears of pain and agony turned to tears of relief and happiness. We sprung into action again. The phone tree was activated. My dad had just gotten on a plane to Chicago so he boarded a plane home as soon as he landed. My sister, Amy, made plane reservations to fly down later that week. Everyone else hopped in the car to drive to Nashville. Within no time at all, the anesthesiologist came to administer my spinal tap. I remember he kept trying to get me to hunch over a little more so he could get it in the right spot. I am pretty sure I had a smart aleck reply about not being able to hunch over much more with my huge belly! I lay back in bed and waited for them to whisk me away to the operating room. Eric still paced the room with a crazy look in his eyes. He had been through the emotional and physical ringer the last couple of days too. He didn’t get much more sleep than me. I also cannot imagine how difficult it would be to watch someone you love go through so much pain and not be able to do anything about it. I was wheeled into the operating room with happy tears running down the sides of my face. I had made it. Praise the Lord for giving me the strength to get through the last eleven weeks. There was a crowd of about 20 people in there. There was my OB and her nurses. The NICU staff was there with an incubator ready to transport the babies to the NICU after delivery. I had also consented to have some nursing students come in to observe the delivery. I guess I was a good learning case for them! At 11:07am Ethan Brent Greer was born weighing a hefty four pounds four ounces. One minute later Ella Bailey Greer was born weighing four pounds. I didn’t get to hold or kiss either of them. I got a quick look at them in the incubator. They each had a nurse who had them bagged and was helping them breathe. And just like that they were gone to the NICU. And I immediately passed out. My work was done. People may hear about my difficulty getting pregnant with Ethan and Ella and think I was pushing fate when we decided to go through fertility treatments. Maybe God just didn’t want us to have babies. After hearing about my struggles to just stay pregnant, they may think that we were still pushing something that just wasn’t meant to be. Maybe we just weren’t meant to be parents. It was a very bumpy road getting to here. Aren’t most of the roads worth traveling anything but smooth? Today Ethan and Ella are healthy, normal eight year olds. They just started second grade. They have already been a blessing to our lives and to so many others’ lives. I can look at them today and see the potential that they have. Ethan is a little math genius like his Daddy and that makes me so proud. But it is his caring heart that brings me to my knees. Every night he prays from his heart for several people. I listen to his heartfelt prayers and know that he is straight from God. He tells me he wants to be a doctor or go into the military. How many lives will my baby save because we were brave enough to fight for his? Ella has a love for reading like her Mama. She is always asking for five more minutes with her book before bed. But it is her nurturing heart that brings tears to my eyes. Since she has been in preschool she has always had at least one special needs child in her class. Ella always gravitates to them. She never looks at them as different. She just wants to be their friend and help them. She tells me that she wants to be a teacher when she grows up. I can see her being a special education teacher like her Aunt Sharon. How many lives will she touch because we didn’t give up on hers? I also know without a doubt that she will be a wonderful mother. How many more generations of children will come from us because we didn’t give up on our family? God was at work in our very bumpy road. He never guaranteed us or anyone a smooth road to parenthood or anything else for that matter. This bumpy road taught me so many lessons that made me a better mom, wife, and daughter in Christ that I would never take for granted. It is hard for me to read this and think this all happened nine years ago. The memories are still so fresh. Now the tears are happy. Little did I know that this was just the start of my journey. With my 20/20 rearview mirror vision, I am thankful for my very bumpy road and the ability it has given me to relate and encourage women. If you know someone that is dealing with infertility or has in the past, please share “Full Heart Empty Womb: How I Survived Infertility … Twice” with them. It may be just the encouragement that they need on their very bumpy road. Happy birthday, Ethan and Ella! What a blessing you are to your Mimi! Love you beyond words! Love to my daughter and son-in-law for traveling this bumpy path to give us these grands! God continues to bless this family through all times. A very Happy Birthday to Ethan and Ella! 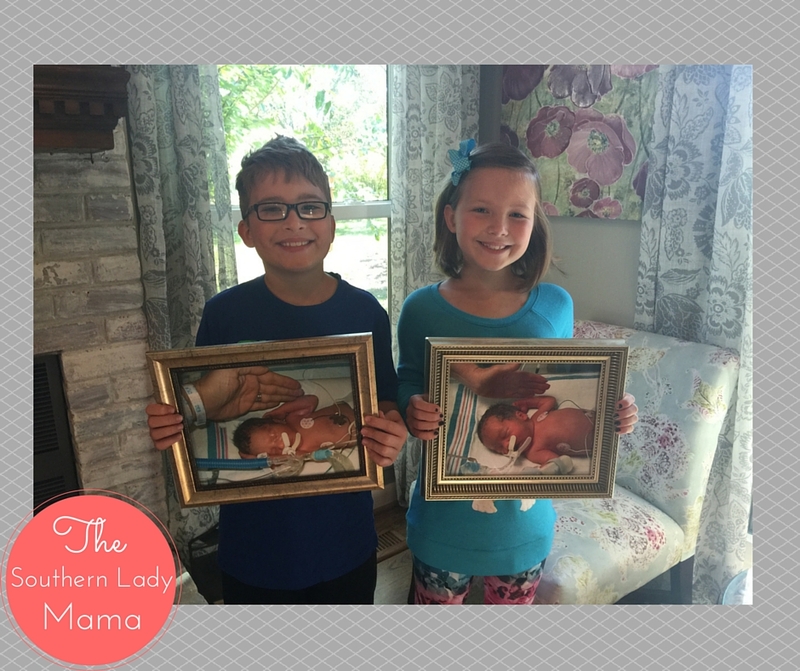 Two awesome kids from a wonderful family…we’re so glad to be friends with y’all!